The good news is that 2013 is sizing up to be a great year for SEO copywriters. Not only have Google’s Panda and Penguin algorithm updates begun to take effect – making ‘low quality’ sites crammed full of keywords less visible – but Google’s preference for prioritising high quality, original content for its readers remains top of their agenda. With the effect of the Panda and Penguin updates still filtering through, Google’s campaign of championing good quality writing (and those that produce it) will continue to set the SEO copywriting world alight in 2013 with the introduction of Author Rank. The rollout of Author Rank, Google’s latest algorithm, could be a major coup for the producers of quality SEO content everywhere. Murmurings of Author Rank go back several years, however; it is expected to finally come to fruition this year. Put simply, Author Rank is Google’s method of identifying and rewarding writers who create detailed, relevant and quality content for its users by potentially giving them a prime position in their search engine result rankings. Potentially is an important word here, as no one is quite sure what Google criteria will use to affect an author’s ranking, but it is thought how many people engage with a piece of content, how often it is shared and the status of the people who share the content could be key factors. In order to be in the running for any kind of Author Rank status on Google, SEO copywriters first need to gain ‘Google Authorship’ status. To give a little background here, Google introduced Google Authorship in 2011 as a tool for writers to link online content they have created with their Google + profile. This then makes them eligible for a ‘Rich Snippet’ (a type of on-page mark up which makes text stand out from other listings) consisting of their photo, possibly a link to their profile and links to other content they have authored. Whilst Google Authorship has been around for a little while, the next phase is Author Rank, where Authorship users have the potential to be ‘marked’ by Google for the content they produce. This score in turn may affect, and potentially, – there’s that word again – improve their ranking. Author Rank is still work-in-progress and whilst there is no evidence at this stage that it is being used to influence rankings, if you create any sort of quality web content regularly, you need to start building a strong online identity to benefit when Google Rank comes into play. Claim your Authorship Status – set up a Google+ account and activate your Authorship status by linking content you have written to your account. By doing this you may be awarded a rich snippet. This will make your profile and content more visible in search listings and improve your click through rate. Content really is King – of course as a skilled SEO copywriter (or employer of) you’re already creating great, highly shareable content but with Google placing even more value on what an individual author bring to the table, creating top content is key. Yes content needs to be strategic and include popular keywords to direct search engines to your site but never so that the keywords are obvious. Make sure your content flows naturally. Your content is a resource to answer reader’s questions, so make sure you answer the question in your article and in your headline. Publish regularly. Aim to issue at least one piece of informative, shareable content a week. The premise of Google’s Author Rank is potentially (final time, I promise) a very good one for an SEO copywriter. Specifically designed to give less profile to faceless operations, such as content farms, instead it aims to reward individual writers for their contribution by elevating their profile, so make sure you set up yours today. P.S. If you found this post informative, why not share it? Thank you. 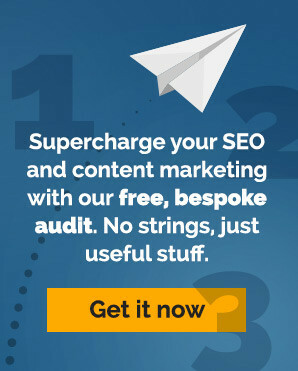 What’s on your SEO copywriting radar for 2013? We would love to know.